Supermarket chain Somerfield has received a £1bn ($1.8bn) takeover approach from Icelandic venture capital group Baugur. Baugur, which already owns a 5% stake in the group, is Iceland's biggest retail owner and has been extending its presence on the UK High Street. In December it agreed to buy Big Food Group, owners of the Iceland chain. Under the bid proposal, Somerfield's current management would continue to run the Bristol-based firm. The company, which runs the Kwik-Save chain, said it was considering the proposed offer. 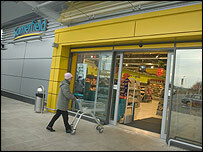 Shares in Somerfield closed up nearly 14% on the news at 184.5 pence. "The hope would be for margin improvement through consolidation with Big Food Group," said analyst Paul Smiddy at Baird. Analysts at Seymour Pierce said another company could now enter the bidding for Somerfield. "The prospect of Baugur raising its bid above its indicative offer price must be slim," it said in a note to investors. "However, we would not rule out a further bidder entering the fray since the Somerfield fascia offers significant potential." Fierce competition has seen UK food retailers come under increasing competition pressure in recent years, with Sainsbury's losing market share to both Tesco and Asda. Somerfield, which operates 700 Somerfield stores about 500 Kwik Save sites, has also faced pressure from price-cutting by the two market leaders. It recently revealed a decline in like-for-like sales and warned of challenging trading conditions. In 2003, the company rejected a takeover approach from retail entrepreneurs John Lovering and Bob Mackenzie. If Baugur is successful with its bid, it will become the fifth biggest food retailer in the UK with a share of about 7.6%, behind Morrison, which bought Safeway in 2003. Somerfield has a pension fund deficit of nearly £79m and the funding of the scheme will need to be addressed before any offer is finalised. Baugur counts Karen Millen, Oasis and London toy store Hamleys among its non-food interests.